Stunning bed crown set embellished with sparkling, crystal rhinestones and pretty pearls. Bed crown has a Fleur de Lis top for a French flair! Shown in Metallic Silver and Vintage Gold. Available in a variety of paint and pearl colors, please see color drop down menus below. Set includes one bed crown (with canopy bar on the back to drape your tulle or other light weight fabric over for a canopy) and one set of crown hooks to swag the fabric. 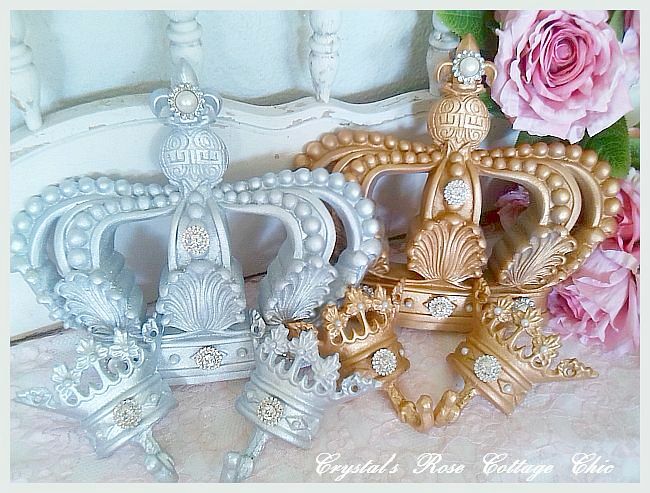 Bed Crown is made of resin and measures 12.5" x 8.5" x 2". Crown hooks measure 4.75" x 4.75" x 2.5".